Losing Winter is site-specific community art project and archive of memories and emotions about the season of winter, using human recollection of weather to provide a glimpse of climate change as it intersects with individual lifetimes. The project was first realized as Pierderea Iernii / Losing Winter with the Muzeul National de Arta Contemporana (MNAC) in Bucharest, Romania through exchanges with local citizens, collaborators, and businesses. At the heart of the project are recordings of over 100 narrated memories from Bucharest citizens about a winter from their past. Intertwined with these memories are details of personal, political, and historical events, familial and cultural customs, emerging naturally as a consequence of the particular memory shared. 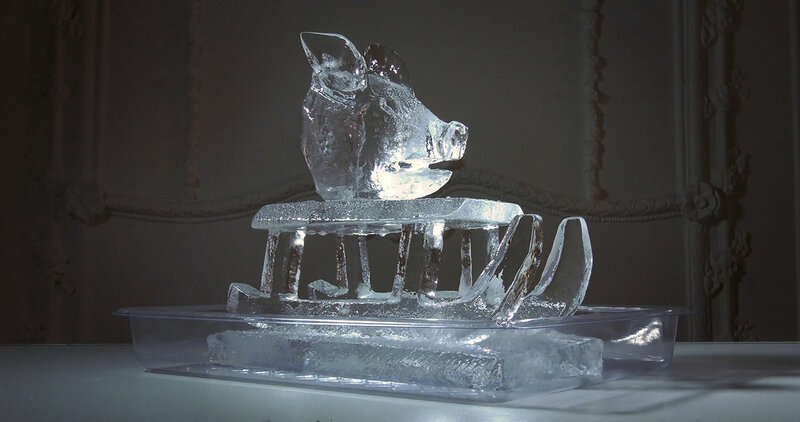 The project also included a series of unique ice sculptures created in response to selected memories which are the subject of Melt, a high resolution video that documents the melting sculptures positioned in various key locations in and around the museum. MNAC is situated in the Palace of the Parliament, the colossal Neoclassical building that was the final act of urban planning by dictator Nicolae Ceausescu in the 1980’s, and across from the newly constructed controversial and ostentatious People’s Salvation Cathedral. Pierderea Iernii / Losing Winter was presented as a multi-media exhibition at MNAC in September 2018. Still image from 4K video. View video here.